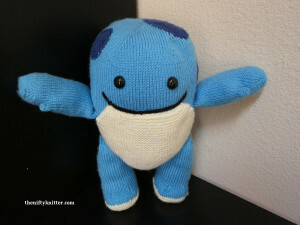 The ooOoo Plushie is a cute, cuddly creature inspired by the Quaggan in the Guild Wars 2 online game. He is a great companion for anything from hanging out at home to adventuring and exploring the world around you. 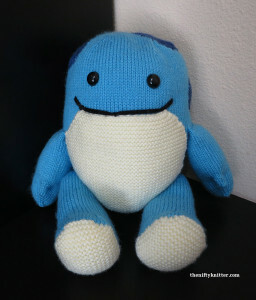 He is super soft and squishy and loves hugs! 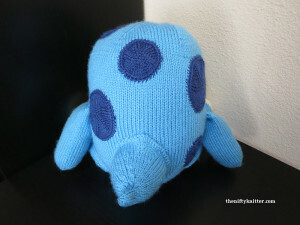 The plushie is knit in pieces and then sewn together. 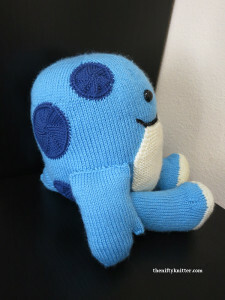 The legs rotate, allowing it to sit or stand (with a little assistance). Finished height is approximately 10.5 inches (26.67 cm) when sitting and 15 inches (38.1 cm) when standing. Size 6 US (4.0 mm) needles. 320 yards (293 m) or light blue worsted weight yarn. 40 yards (37 m) of dark blue worsted weight yarn. 65 yards (60 m) of cream worsted weight yarn. A small amount of black worsted weight yarn. Two types or colors of stitch markers. Two 18 mm safety eyes. Tapestry needle to sew pieces together and to weave in ends.